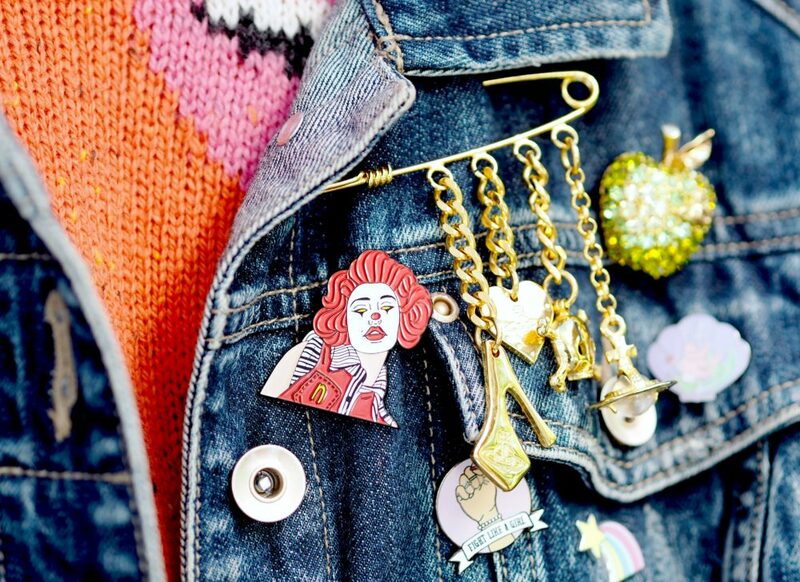 Hot Right Now: Pin Badges - Fashion For Lunch. Pin badges are hot right now and along with patched jackets, I’m totally feeling this trend. For the last few months I have been wearing excessive amount of pins on my denim jacket, but it’s not until the last few weeks where I have really raided my jewellery boxes and done a little shopping to ramp up the look. I feel like my jacket is still work-in-progress, but it’s starting to get there. Here are a run down of some of my favourite badges / brooches, as well as some hints and tips on where to buy the best pin badges! 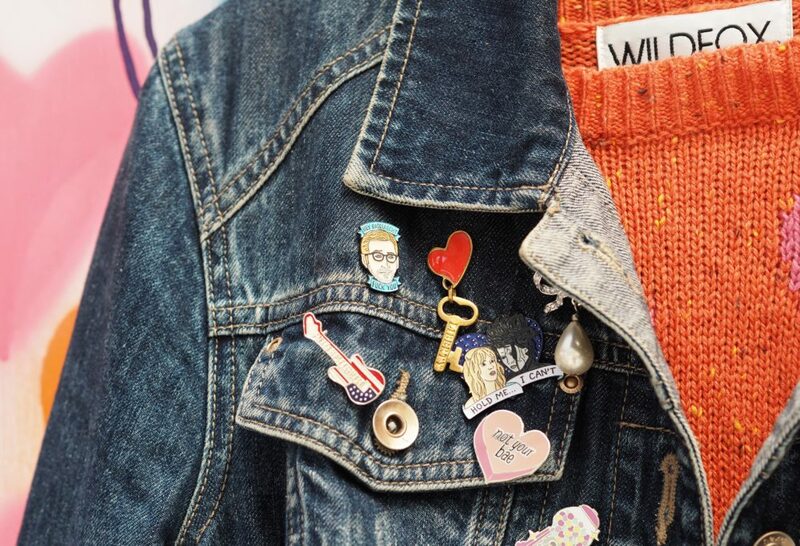 There are also some super cute pin badges at Punky Pins, I have quite a few of these on my jacket, some of them are from Punky Pins directly, others I ordered from La La Land, which is a really cool online shop. 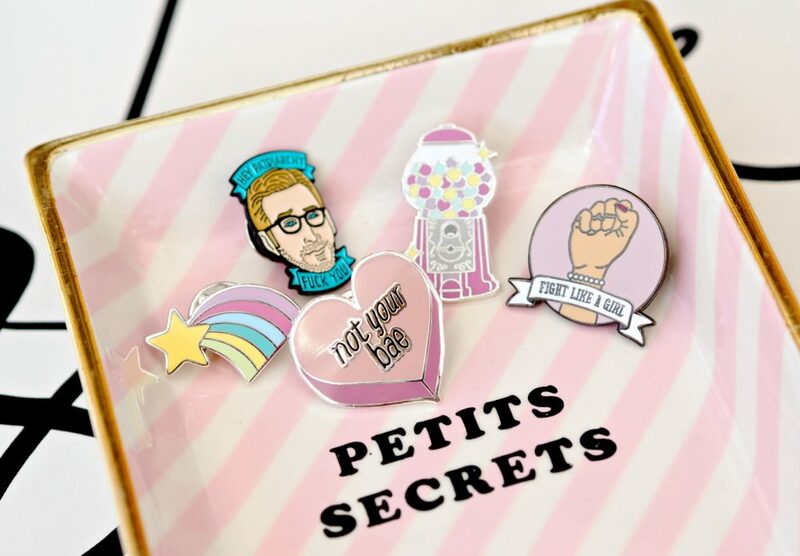 Punky Pins have some really fun pin badges inspired by food, films, music and girl gang slogans. Look out for the Mean Girls badges, the Burn Book design is brilliant! 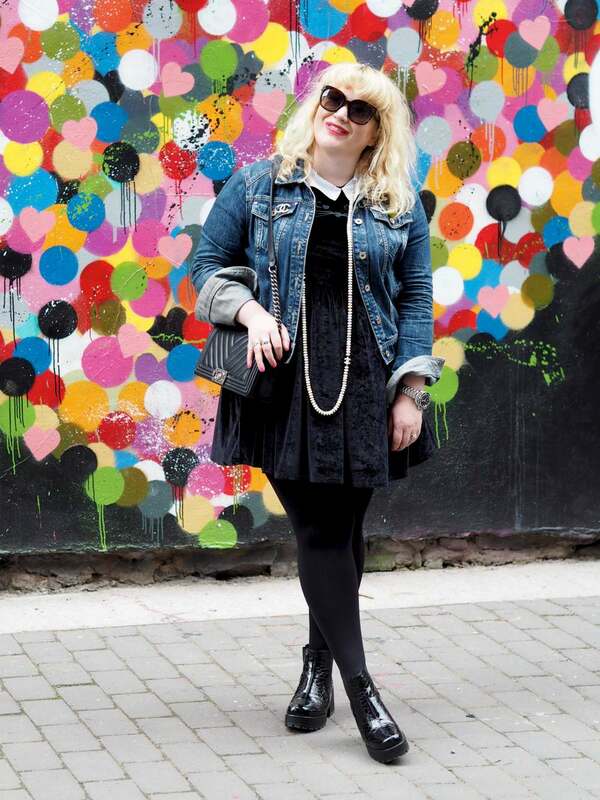 Tuesday Bassen has been in the press a LOT lately. Basically Zara has ripped off a lot of her designs, as well as some other amazing designers (a few of which are mentioned in this post). She has been at the forefront of trying to raise awareness of the matter and she is not showing any sign of stopping! This girl is awesome, in fact, go to this tweet, have a look and maybe give it an RT, also let Zara know you are not impressed. 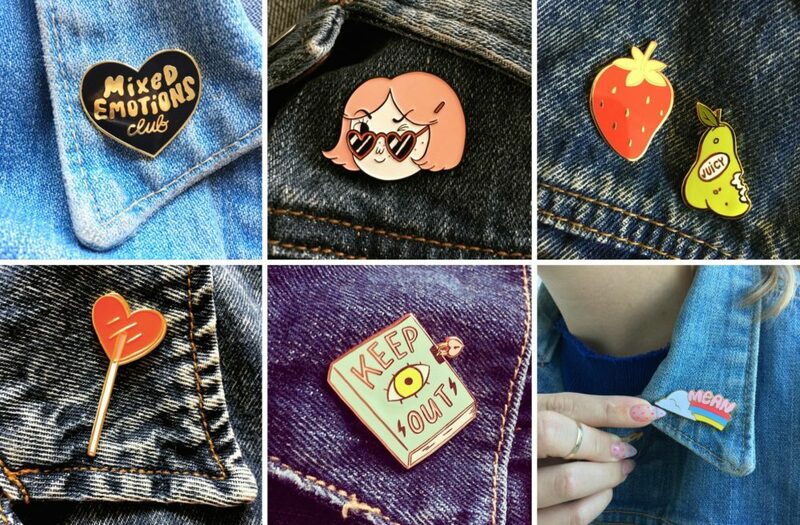 If you want to buy her pins, you can shop them via her online store. I’m also obsessed with Robin Eisenberg, she is an amazing illustrator who makes some of her work into pin badges. See the pin of a girl dressed as Ronald Mcdonald? That’s photographer Nadia Lee Cohen, it’s taken from a shoot she did and all profits were donated to a charity who provide moon cups to women and girls living in slums. If you don’t already follow @RobinEisenberg or @NadiaLeeLee on instagram, you should. They both have insanely good accounts. Gelareh Mizrahi is a super cool handbag designer who’s bags I have been lusting after for a couple of years now. One day I will buy one, but until I do, I think these pin badges are super cool and bang on trend. The feature her iconic handbag designs shrunk down and made mini. 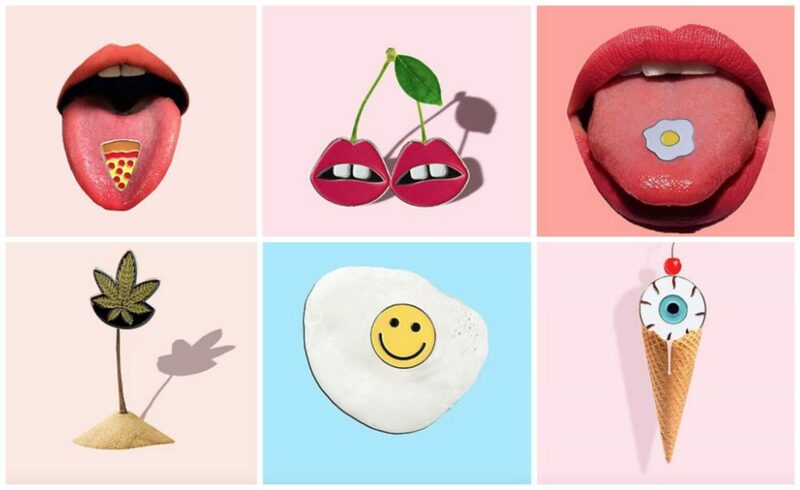 The eye ball, pizza and cherry lips are particularly cool! BTW, if you want to really tease your bank balance, check out the Gelareh Mizrahi handbags, they are amazing! Yep, I have a lot of Chanel and Vivienne Westwood brooches. The reason being, is because I love adding them onto my coats and jackets to add a little extra detail to my outfits. I usually only wear one at a time, but recently, I have been wearing a few. Originally, I only paired these designer brooches with my pin badges as I didn’t have enough pin badges to make a statement, but now I quite like mixing the two. I think it’s a little more fun and it’s fun to play around with the different textures and sizes. 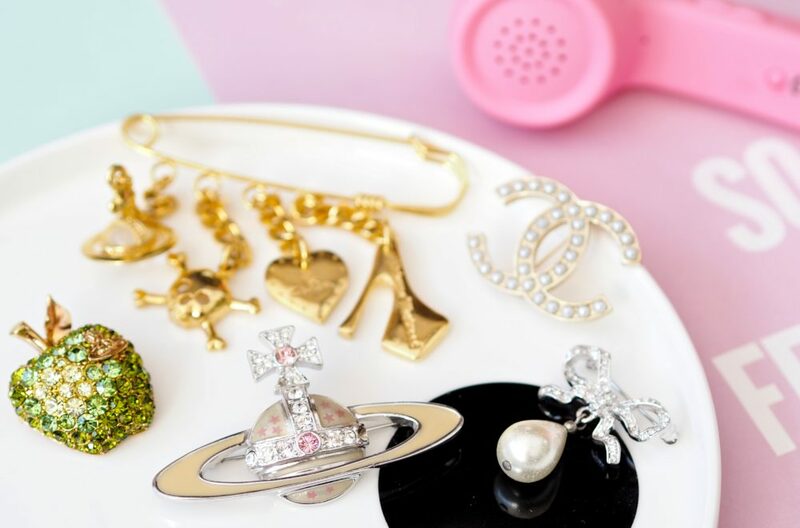 If you are looking for designer brooches, I would highly recommend looking at Chanel, Dior, Vivienne Westwood and Lanvin, but it might also be worth checking Vestiaire Collective for a big selection of pre-owned designer brooches which might be a little cheaper than buying current season. Pin badges were a big trend in the late 80’s and early 90’s, spend a little time searching in vintage shops and charity shops and you might find a few gems! My mini guitar was from a charity shop and I have some really cool button badges somewhere in storage too. I wish I could get them out and take some photos of them, but I literally have no idea where they are! Another great place to buy vintage pin badge is Ebay, if bidding isn’t for you, then head straight to the ‘buy it now’ section. 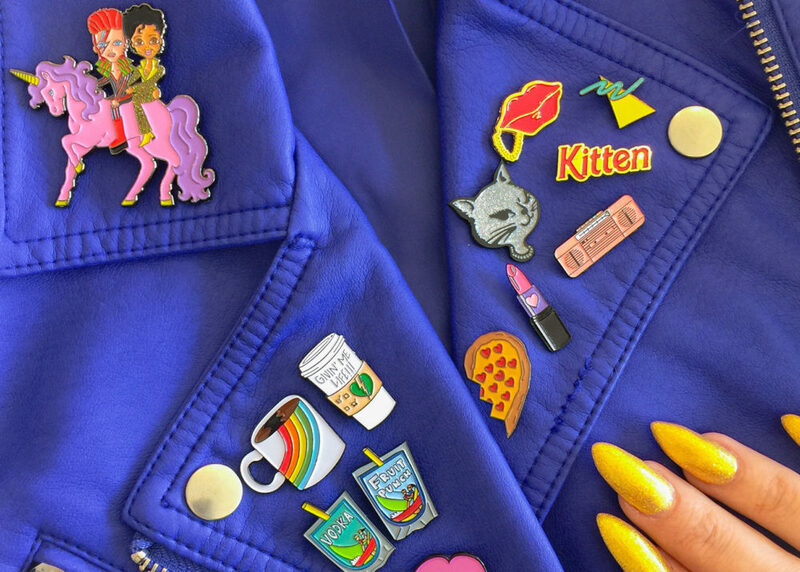 What do you think of the pin badge trend? 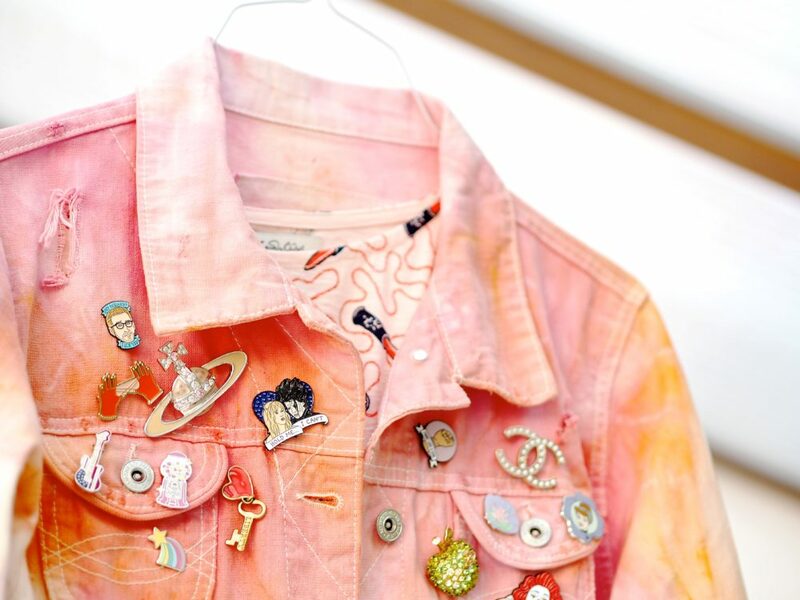 Are you tempted to rock a few pin badges? First and foremost your nails are popping lol.I always love pin badges but I stopped wearing them in high school I would love to get back to it again. I used to collect days on end. Ah, i wish they were my nails, but that image belongs to the brand!! you should totally get back on board with pin badges! join the gang!!!!! !